At times I get bored baking cookies for my husband every week. To change things up, I tend to make silly recipes like these 1970s no bake "cookies" on days I can't face another cookie. This is one of those love ‘em or hate ‘em recipes. 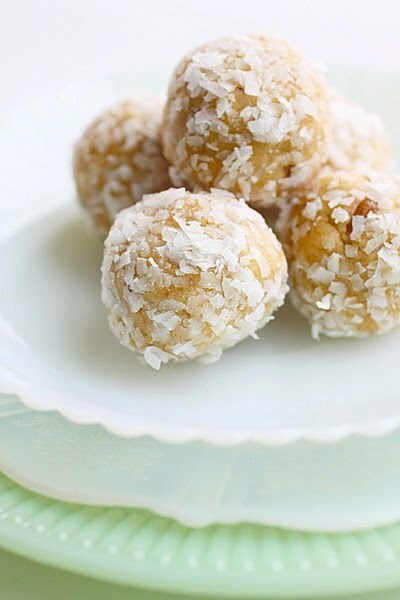 These coconut-covered balls are intensely orange with a cookie dough consistency. I don’t happen to like most no bake cookies, and these are no exception. However, I’ve had so many requests for these darn things I’ve given up and am posting the recipe anyway. Here you go Eric and Aunt Trina and the rest of you weird no bake cookie lovers. Enjoy! 1. Spread chopped nuts on a plate and microwave in 30 second increments until toasted, tossing between stops. Usually takes about 1 1/2 minutes total. Set aside to cool. 2. Crush Nilla Wafers until fine in a food processor or plastic bag. Mix wafer crumbs, orange juice, powdered sugar, butter, and chopped nuts together. Shape the mixture into walnut-size balls, and gently press in coconut. 3. Store "cookies" in the refrigerator in a covered container. Layer cookies between sheets of wax paper if stacking. Notes: Aunt Trina thinks these would be great sans coconut and dipped in dark chocolate instead. Sounds like a good idea to me! Original recipe source unknown. Picture by Laura Flowers. Cool. I've never heard of these types of cookies. What a great combo of ingredients. It looks simple to make and just lovely!! Thanks for sharing this recipe. Wow those are awesome, they look yummy to eat. I love and enjoy making them and making a mess in the process. I <3 your blog, love it. That definitely screams 70's to me. Have you seen the collection of weight watchers recipe cards from the 70's? All sorts of weird stuff. And I agree with your assessment of no-bake cookies. I'm not a fan--they I like a little crunch to my cookies. Plus, if I wanted cookie dough, I'd eat cookie dough. mmm a lovely treat those coconut cookies! I think I would love ‘em! Very pretty! My mom has a bunch of no-bake cookie recipes that she loves to make... These remind me of one of those recipes. I bet these are really good! I love orange flavored sweets! I like this recipe....it is similar to brandy balls, that are made with nabisco chocolate wafers and are my favorite no-bake cookie recipe. Wow - blast from the past! My mom made these every christmas, and they were always the favorite Christmas cookie! Fun to see the recipe online! You bake cookies for your husband every week!?! I am impressed and NOT telling my honey about this...he will start making demands lol! Cristin so glad I could help! Yeah Katie, I've been doing this for 2 1/2 years now... Think Jesse's work will notice if I send him with Oreos this week lol? This is just plain funny! I adore those old kitch recipes and these would be fun to make at least once. I do live Nilla Wafers though! These cookies look easy and delicious. Do you know how many cookies this recipe yields? Gosh I can't remember. A lot if I'm remembering correctly. More than 60 I think. I just remember scooping and scooping! I made these with pineapple juice instead of orange, and a wee bit of rum (okay, 1/4 cup, so if you try it, adjust the juice accordingly). ta da! pina colada balls. perfect for for my mid-august (no) bake sale. cheers!